I have long heard the adage “Real men don’t eat quiche!” and every time I have heard it I think the same thing “What a stupid, overly-macho thing to say”. There’s nothing wrong with quiche; if it’s done well it’s actually incredibly tasty. It’s also incredibly easy. It can have as many or as few ingredients as you like, it can be made with or without a crust, it can be vegetarian or chock full of meaty goodness, and it can be served for any meal you choose; there are few things as versatile as quiche. Honestly, my husband was not sold on the whole quiche idea at first either. Not because it wasn’t “manly” but because all he’d ever had was mediocre quiche. (As it turns out he grew up on mediocre food and I’ve had to “convert” him on pretty much every single dish I’ve made. However he learned early on to trust my cooking abilities and gladly tries whatever I put in front of him.) When I made this quiche for him the first time he loved it and then I jokingly told him “You know, it’s been said that real men don’t eat quiche.” He looked at me and in all seriousness said “Then they’re stupid. It’s breakfast- in a pie! How can you not like breakfast pie? !” And trust me- my husband is all man. So for this quiche I have only one picture. I had forgotten that I was supposed to blog this recipe. I took the mixture out of the freezer, thawed it, layered it with cheese in the pie crust, added the eggs, baked, sliced, & served it, and THEN remembered. So I only have this one picture- but it’s a good one! Isn’t that pretty? And so tasty! 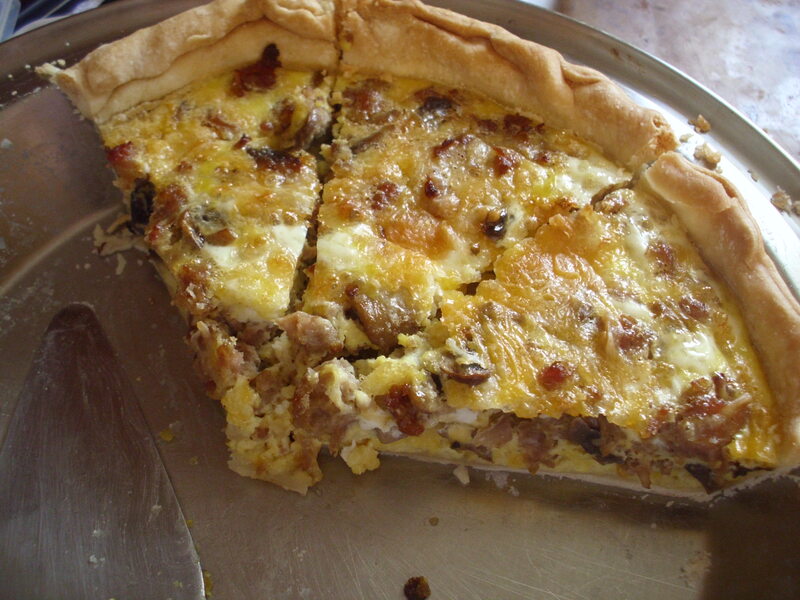 For this quiche I used a sausage mixture with which I had made another quiche previously. One pound of sausage will make 2 quiches, thus adding to the ease of preparation for this dish. (I’ve added the ingredients I used for this one to the end of the recipe.) It really is breakfast pie- how can you not like that? *Beat eggs together with the milk in a small bowl. *Layer the filling ingredients into the crust then pour the egg mixture evenly over that. *Bake for 35-45 minutes or until a knife inserted in the center comes out clean. *Cool at least 15 minutes, slice and serve. Quiche is best when it’s not too hot so try not to skip this step. Brown the sausage in a large pan. Without draining, add the onions and mushrooms. Cook until the onions and mushrooms are soft. Cool. Divide into 2 freezer safe containers and freeze, use half and freeze half, or make 2 quiches (you can freeze whole, cooked quiches. Just put the frozen quiche straight into the oven and bake at 350 until it is heated through). This sausage mixture goes really well with mozzarella which is what I used in the quiche pictured above. This recipe has 4 ingredients. That’s it. Four. It’s seriously that simple. I know- it looks like 5. It’s not. The bowl on the left is the strained liquid from the chicken. That would be the Crockpot part. You put the chicken in your Crockpot on low (with no extra liquid) in the morning and leave it all day. I even put my chicken in frozen. There is some debate as to whether or not putting frozen meat in the Crockpot is safe. Personally I think it’s fine for some kinds of meat. Putting frozen boneless, skinless chicken breasts or similarly sized pieces of frozen meat in the Crockpot is fine with me. What I will not do is put a whole roast, chicken, or other large piece of meat in if it’s frozen. Then you really are inviting bacteria to come and make you, your family, and your friends violently ill. So go ahead- put the frozen chicken breasts in the Crockpot, turn it on, and leave for the day if you’re comfortable with it. If not- use thawed chicken. After slow cooking the chicken for at least 7-8 (or 5-6 if using thawed chicken) hours take it out of the juice, shred it (it will be so tender that all you have to do is mash it a bit with a fork), and set it aside. Strain the juice leftover in the Crockpot and reserve it. Put the chicken back into the Crockpot and turn it on low. 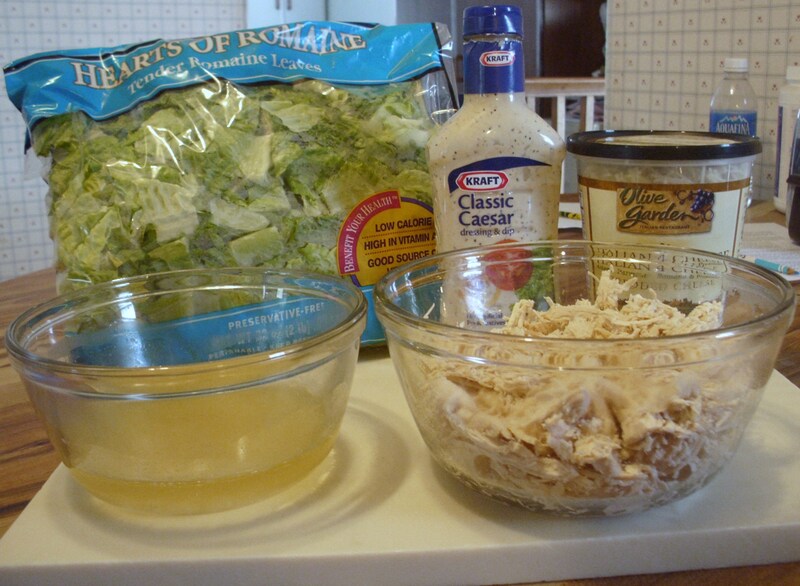 Add about 3/4 of a cup of the reserved liquid, then about half a bottle of your favorite Caesar salad dressing, give it a good stir, put the lid back on, cook for about another half an hour, add 1/2 a cup of shredded Parmesan cheese and serve over Romain lettuce. That’s it- you’re ready to eat. OR you can serve it right after you add the dressing. Just add the cheese at the same time and serve. Doesn’t that look tasty? It was- I assure you. 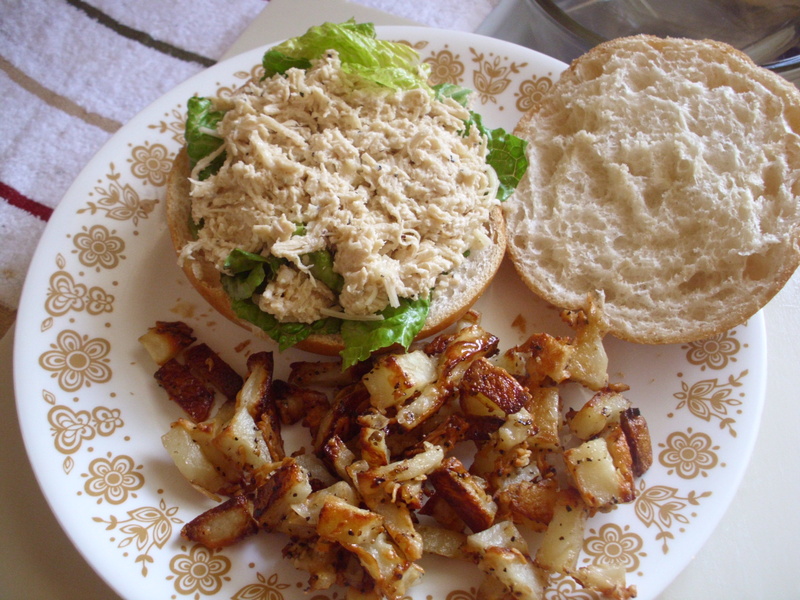 I serve this on a Kaiser roll but any soft roll or bread will do. Or you could serve it on the lettuce alone as a salad and it would be equally delicious. The cold leftovers are just as good as the original- maybe even better. And all the prep combined totals about 5 minutes- a little more if you have to chop the lettuce. I bought mine pre-chopped because it was the best looking stuff at the store at the time. So here you have it; “5 minute recipe” convenience, great taste, and pocket-book friendly. What more could you want? *Cook chicken in Crockpot at least 7 hours (6 if using thawed chicken). *Add chicken and 3/4 C reserved liquid back into Crockpot along with the dressing and stir to combine. *Cook on low at least 30 minutes. 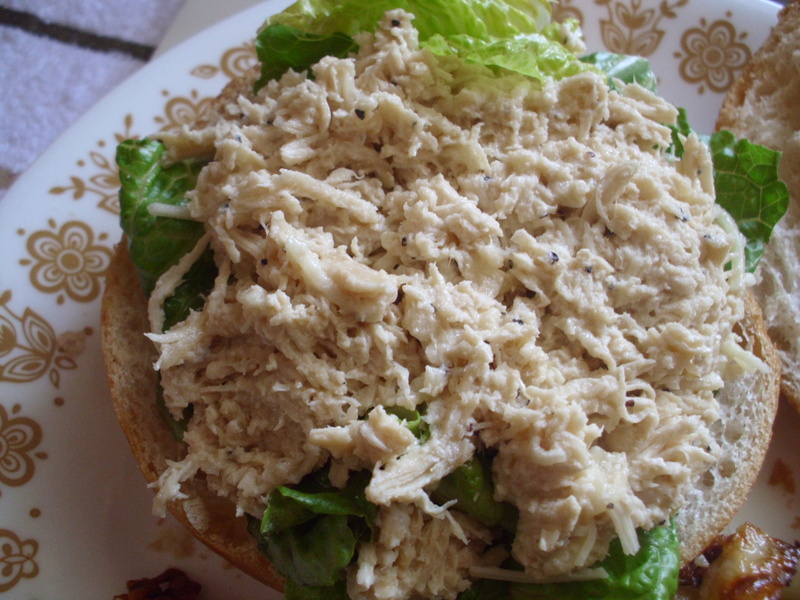 *Take off heat, add the cheese and serve over the Romaine as a sandwich or salad. *OR Add cheese along with the dressing and serve immediately. The chicken will still be great, it just won’t have time to take on the flavor of the dressing as much as if it had been allowed to continue cooking.